Domaine du Cros d’Auzon is a fantastic family friendly campsite that lies along the banks of the Ardeche River on the outskirts of the beautiful village of Vogue. Surrounded by fields and trees, the campsite is a tranquil oasis, perfect for families looking for a peaceful holiday location yet with plenty to see and do, both on site and nearby. The nearby village of Vogue has everything you could need whilst on holiday including shops, restaurants, bars and cafes. The centre of the village is only around 2km and is well worth visiting. Designated as one of the most beautiful villages in France, Vogue is dominated by its 12th Century Chateau which is a splendid sight. Those who love to splash around in the water will love Domaine du Cros d’Auzon. Direct access to the campsite means that children can build dams, splash around and fish and the on site pool complex is also fantastic. 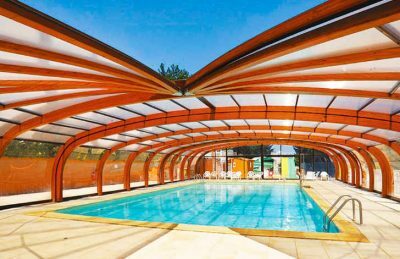 Boasting a heated indoor pool, 2 further outdoor pools, a paddling pool and 3 water slides, the aquatic area at Domaine du Cros d’Auzon is fantastic for families of all ages. The patio area that surrounds the pool is also brilliant for those who prefer to soak up the sun whilst the children play in the water. Domaine du Cros d’Auzon is in a fantastic location and also provides a comprehensive range of on site activities and facilities. On site activities at Domaine du Cros d’Auzon campsite include multi sports area, aqua gym, football, basketball, volleyball, mini golf, table tennis, boules, tennis and a playground. Facilities available at Domaine du Cros d’Auzon campsite include WIFI, restaurant, snack bar, takeaway, bar, pizzeria, groceries, animation team, games room, tv room, washers and dryers.